While I finetune the freebie-hat-in-progress I thought I'd take a moment to thank my friend Sharon once again for giving me my very first stainless steel stockpot. It's housed many a chicken stock and many a batch of corn on the cob and these days, it looks after my knitting for me. I used to use one of those folding knitting stands with tapestry stretched over a wood frame, but I was always losing stuff in there and of course now it's full of (neatly organized!) knitting needles. 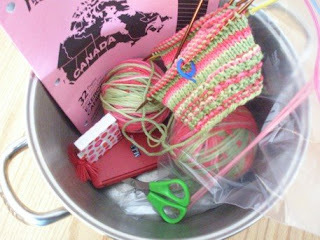 During my recent pre-Christmas KnitFrenzy, I had different projects scattered across a collection of cloth bags filled with Ziploc bags, as well as needles that fell out and rolled across the floor because cloth bags flop over. The worst was never being able to find the stitch marker I'd tossed into the bag from the last project... I kept having to track down my tools, which were invariably in some other flopped-over bag. That's when I thought of the stockpot. It's the tall narrow kind and, being steel, wouldn't dream of flopping. If I reach in to get something, there's no risk of my fumbling through folds of cloth and dropping the stitch marker to the bottom; I simply locate it with my fingertip and drag it up the side. Its two handles are very convenient for carting it from one knitting zone to another, and the walls are so high a ball of yarn can jump around all day and never pop out. An added bonus: it blends right in on the kitchen counter. Because where else would you keep a project bucket? Hi Mboo! I just love the picture with your added special effects of the notebook with a picture of our country on it. Quick question for you. After rolling your yarn into lovely little kitten batting toys do you start at the end on the top or the one from the inside? I still haven't mastered the art of rolling a ball so you can pull from the inside without ending up in a tangled mess, so this ball is definitely worked from the outside. I have however mastered the art of finding really, really kind yarn purveyors who will wind a skein for you, and those ones (which look more like kitten batting wheels) I pull from the inside. Isn't it cool that they still sell these notebooks? I remember using them in school!